In order to upgrade the bow, players should complete 10 missions named Bow Legends. Completing all Legends will bring you 4,000 XP (400 each), 3,450 Mirian and additional 500 Mirian for bonus objectives (50 each). In order to upgrade the legend of your sword, players should complete 10 missions named Sword Legends. Once you complete them all your sword gets new markings. Other than this “awesome” reward, completing 10 Sword Legend missions bring 4,000 XP (400 each), 3,500 Mirian and additional 500 Mirian for bonus objectives (50 each). Shadow of Mordor Hunting Challenges guide with screenshots and detailed information where to look for hunted creatures in 10 challenges. Shadow of Mordor Console and PC Graphic Comparison video shows the differences between the PlayStation 4 and PC version of the game. On the second map, The Sea of Nurnen, players can collect 23 shining objects named Artifacts. Each Artifact rewards you with 50 Mirian, and upon collecting them all you’ll be rewarded with the Shadows of the Ancient Past achievement. While leveling up your character in the Middle Earth: Shadow of Mordor, players should focus on unlocking Abilities and maximizing Attributes. You can unlock 39 Abilities organized in 5 Tiers, and divided into two unique skill trees Ranger and Wraith. In order to unlock a new Ability you have to earn Power. Middle-earth: Shadow of Mordor Ithildin guide unveils all secret locations where you can find collectibles on the second map. 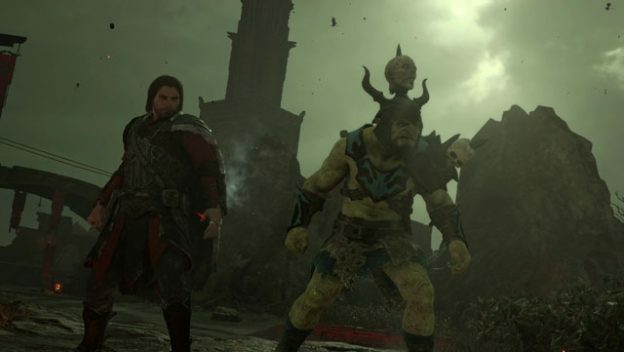 In Middle-earth: Shadow of Mordor you can change Talion appearance into Dark Ranger skin if you pre-ordered the game on any platform. Middle Earth: Shadow of Mordor Achievements and Trophies list with details and corresponding number of Gamerscore points and Trophy values. Shadow of Mordor Ithildin Locations Guide with screenshots will help you discover 16 ancient symbols and unlock the Shadows Crowned with Living Light achievement. Shadow of Mordor artifacts locations guide with screenshots will help you discover 42 collectibles and unlock the Shadows of the Ancient Past achievement. The full PS4 control scheme for the Middle Earth: Shadow of Mordor with additional controls while mounted on Caragor. Shadow of Mordor List of Controls and Keyboard Commands provide shortcuts to many of the most frequently used commands for mount attacks, movement and much more. Middle Earth: Shadow of Mordor offers two unique skill trees organized in 5 Tiers, where you can unlock Ranger and Wraith abilities.